Harvard women’s basketball coach Kathy Delaney-Smith insists that her accomplishments are not “extraordinary.” But as she enters her thirty-fifth season, she is the second-longest tenured head coach in Division One women’s college basketball. She has the most overall wins of any coach in Ivy League men’s and women’s basketball history (546-375 overall, 322-142 Ivy). And she is the lone coach (male or female) to lead a 16-seed over a one-seed in the NCAA tournament (the Crimson’s 1998 victory over Stanford, 71-67, on the Cardinal home floor). Many coaches who have enjoyed such enduring success are associated with a specific style of play. Pete Carril—the former Princeton men’s basketball coach who is second to Delaney-Smith among Ivy coaches on the all-time win list, at 514—created the Princeton Offense, a methodical system that slowed the game and allowed the Tigers to compete with more athletic opponents. Sign up for Harvard Magazine’s basketball e-mail and follow the Crimson all season long! David L. Tannenwald ’08 will provide the latest news, game summaries, and insights. “Act as if” embodies Delaney-Smith’s belief that performance is at least 80 percent mental. She has long drawn on motivational techniques from academic disciplines like psychology and leadership. As Maura Healey ’92 and Trisha Brown ’87 recalled, their coach employed visualization, mindfulness, and sports psychology in the 1980s, decades before they were in vogue. She and her players are currently studying Harvard Business School associate professor Amy Cuddy’s work on body language and presence. And for new approaches, the coach can always turn to her bookshelf, which is lined with still more Crimson academic volumes, among others, like Ron Heifetz’s Leadership on the Line and Rosabeth Moss Kanter’s Confidence. Delaney-Smith complements these motivational techniques with a knack for forging strong relationships, a critical skill for recruiting and molding top athletes. She connects with people through her approachability (her players call her “Kathy,” not “Coach”) and sense of humor. She also demonstrates concern for her players’ holistic development—an attribute that, as Healey said, is critical for young women at a pivotal stage in their lives. Delaney-Smith’s emphasis on psychology and relationship-building does not come at the expense of managing her players’ game; rather, it gives the squad the confidence to play in the coach’s adaptive style. On offense, she encourages her teams to run (i.e., move the ball quickly up the floor) and look for a three-pointer in transition—a play she emphasizes, she explained, because it is a relatively easy and high-yield shot. But she’s prepared to emphasize getting the ball into the post during years when she has tall, talented forwards and centers. When the other team has the ball, Delaney-Smith mixes aggressive man-to-man defense with unorthodox permutations and shifts. These unusual defenses—along with trick plays on offense—keep opponents off guard and provide opportunities to engage in “risk-taking” that she and her players enjoy. Finally, Delaney-Smith aims to avoid over-coaching—she doesn’t want to dampen her players’ instincts and self-assurance with excessive schemes and instructions. Delaney-Smith’s competitive drive and her ability to form relationships and mold her teams have produced extraordinary success. A case in point was that 1998 upset of Stanford. According to Allison Feaster ’98, the fifth pick in that year’s WNBA draft, the win was the perfect culmination of four years of building cohesion. Still, that victory would not have been possible without Feaster, a three-time Ivy League Player of the Year who committed to Harvard in part because she sensed that Delaney-Smith was a “strong woman”—something she picked up on thanks to the coach’s hyphenated last name. That points to Delaney-Smith’s long advocacy for women and women’s sports. 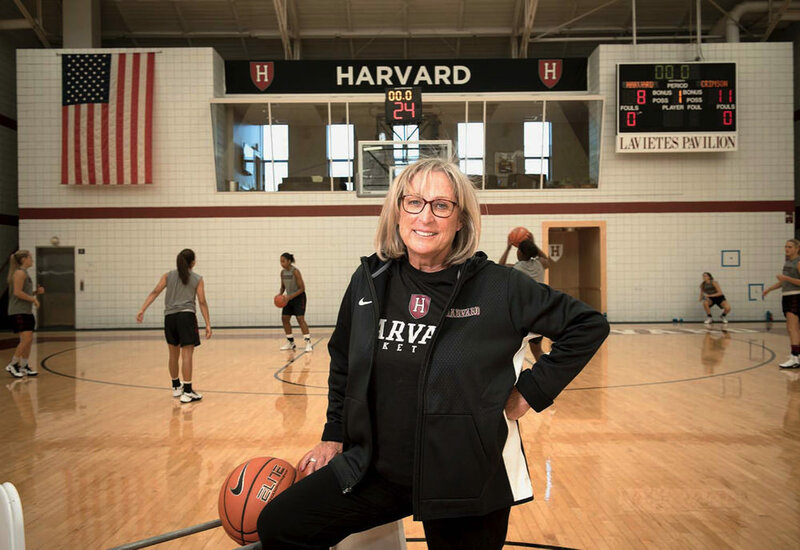 Before coming to Harvard, she coached at Westwood (Massachusetts) High School, where she compiled a 204-31 record—and filed four Title IX lawsuits to ensure that her players had the resources they needed, including equitable access to the school gym. She received numerous college coaching inquiries, but the only call she took seriously was Harvard’s, because the hiring committee demonstrated a commitment to gender equity. Close and candid bonds with players have helped fuel Delaney-Smith's success. Nonetheless, Delaney-Smith has had to continue her advocacy in Cambridge, soliciting financial support and promotional coverage for her team and, at times, directly confronting sexism. Several recent alumnae recalled arriving for a pre-game shoot-around on the road and discovering that the opposing school’s men’s team occupied the floor. Delaney-Smith—who subsequently voiced her concerns to the host university’s administrators—instructed her players to stand at the edge of the court, basketballs in hand. Such stances have made an impression. Stemberg Family coach of men’s basketball Tommy Amaker noted parallels between Delaney-Smith’s journey and that of Democratic presidential nominee Hillary Clinton. Similarly, Maura Healey, now attorney general of Massachusetts, depicted her coach as leading by example, and a formative influence on her career in civil-rights law. Delaney-Smith identifies her mother as her own role model. Peg Delaney laid the foundation for “act as if” by encouraging her children to push through injuries. She also coached Delaney-Smith at Newton’s Sacred Heart High School, where her daughter became the first woman in Massachusetts high-school history to score 1,000 points. Delaney-Smith set that record playing the now-outmoded six-on-six version of basketball, so when she began coaching at Westwood, after graduating from Bridgewater State, she had to learn how to coach five-on-five—the first “act as if” moment in her career. She has not stopped since, even during the 1999-2000 season, when she underwent chemotherapy for breast cancer. With the addition of a talented recruiting class led by McDonald’s All-American Jeannie Boehm ’20 and the return of a young nucleus from last year’s NIT team, the Crimson has a legitimate chance of achieving that goal soon. Delaney-Smith is poised for a dramatic final act.